It looks an awful lot like there's going to be a Synchro sitting in my loft soon, alongside a rather nice Betancourt Warrior too. Both kites I would have thought at least straightforward to move along but it seems not. Any creative notions for how to dispense with them ? In all honesty the money side of it bothers me very little - my teeth are in good order, my bills paid and the socialist paradise of Finland provides all the health care I need - but I didn't want to undercut the market in any of my sales. run a raffle.....20$ a ticket to get to the sale price? The green Warrior was too expensive. PBSKs are very hard to move these days. Possibly. But I didn't even get a nibble, a trade suggestion, no enquiry whatsoever. And it's been on the block several times. Mike, I may be able to help with the Synchro after all. Give me an email please. The green Warrior sat in the swap without a nibble before I traded it to you. Not saying it makes sense, it's a great kite. 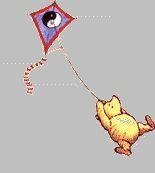 Probably the best all around kite Peter ever made. It is amazing the number of great kites sitting on the swap. Moonies, Mantis set, Sea Devils, A*, etc. all for a couple hundred bucks. A few years back, these would not have lasted long. No doubt PBSKs are gorgeous. Seems to be a buyers market though. Got video of the Warrior? That might help. Money is tight for a lot of people right now. There are 2 main things that stop people from buying a lot this time of year. The first one is Feb and march is when the bills from christmas buying show up and then you have the ever pain of taxes to deal with. ON top of that daily necessities have gone up 10%+ in the last 2-3 months. Budgets are taking hits from all directions so funds for the "wants" are taking longer to save up. What does a Warrior fly like? I was guessing it would be somewhere around the Outer Space in terms of kite evolution? I was kind of tempted myself but thought it a little pricey for something 13 years old in developmental terms. How generous are you feeling Mike?.....it might make a nice VF prize?